So I looked at the hits I have received thus far since starting and it shows I have had 126 hits from 6 different countries! Wow thanks a ton for reading people! I’ll try to keep the posts coming!!!! ACL injuries and other such knee ligamentous pathologies are by far some of the more common and more devastating injuries in sports. Each year 2,220 ACLs are expected to be torn just in female college athletes alone with basketball players having the highest percentage. Some people attribute this preponderance of injury in women to a number of factors including narrowness of the intercondlylar groove of the knee, strength, flexibility and endurance. However, the current literature seems to consider jump landing strategies as function of neuromuscular control to possess the strongest causal link. This idea is reasonable as the mechanism of injury for ACL tears are deceleration/change of direction non-contact injuries with the foot planted. Thus if an athlete lacks control at the knee each time he/she lands the force from impact would be placed passive structures since the active structures don’t fire correctly thus potentiating the risk of injury to ligaments etc. Due to this knowledge jumping programs focusing on correcting the valgus angle or frontal plane strategies have been initiated. These programs have had success but what researchers, therapists and coaches have trouble with is finding a way to fit these jumping programs into existing strength and conditioning programs. Most studies for valgus prevention utilize programs that last 6-8 weeks and each session can last 20min-1hr, which in the realm of athletics is too long to add to what typically is a very tightly scheduled regimen and programs that long may present problems with compliance . What Lee Herrington’s study examined was whether or not a program in 4 weeks, 2 times a week, for 20min per session could result in the same benefits of the longer jumping programs. The study took place in Manchester, UK and the subjects were 15 female collegiate basketball players with no history of ACL or other such knee pathology. He evaluated knee “function” through three measures; 1) knee valgus upon landing from a depth jump to simulate a player landing from grabbing a rebound or finishing a shot, this was done via a digital video recording 2) He had the players run from half court to the foul line and shoot a jump shot, this was done to evaluate the players in a functional movement pattern specific to their sport and since the players would more likely concentrate on making the shot it than jump “correctly” which would expose their more normal jumping and landing strategies. 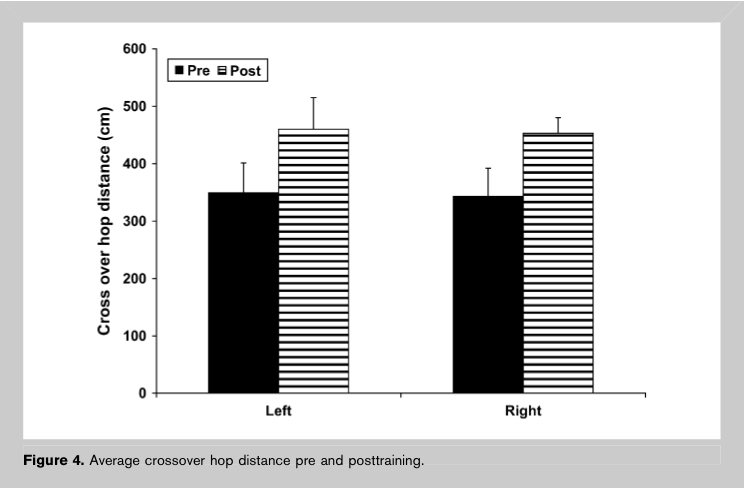 Again the valgus angle was recorded via a digital video recording 3) The players were tested on lower extremity power by having them perform a cross over jump test. 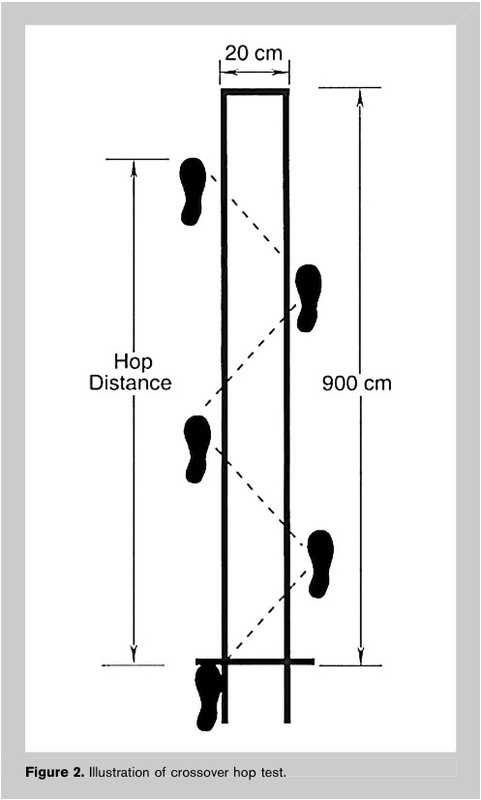 The test required the players to jump on one leg on diagonals across a line three times with the goal of traveling the farthest possible with 3 reps/jumps. All subjects were evaluated on all 3 measures at pretest and then initiated a jumping program where they were first educated on how to land correctly with the knees in line in a “sagittal plane strategy” and performed all exercises with close monitoring for form. The program consisted of various plyometric and agility exercises with some basic strength components as well. All subjects completed between 10 to 12 sessions and were all instructed not to perform additional training on the day of each session. The researchers evaluated the test retest reliability for each measure on 5 players independent to the study to evaluate for error and all were found to have high reliability and very small amounts of difference between measure for each recording. The minimal statistical change for the depth jump was 1.2deg, 2.2deg for the jump shot, and 79cm for the cross jump test. Upon post-test the results were quite impressive. 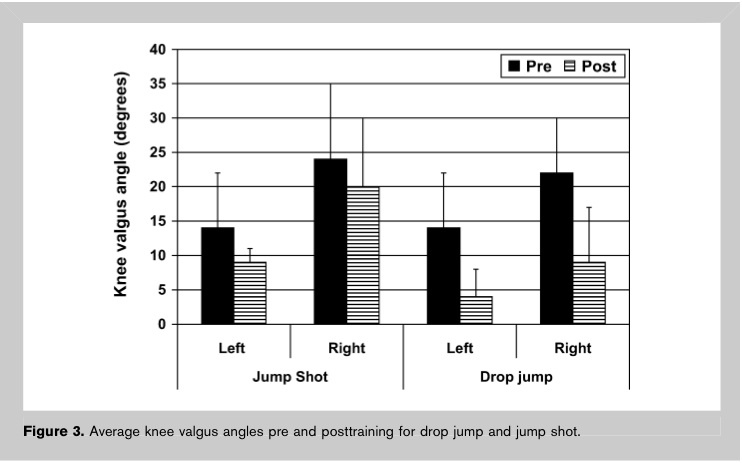 The valgus angle during the depth jump on average decreased by 9.3deg on the left and 12.3deg on the right; the the jump shot valgus angle on average decreased by 4.3deg on the left 4.5deg on the right; for the cross jump test the left improved by 111cm and the right improved by 110cm. All of these results were significant to a p level of 0.05. Though the subject size was relatively small and this was only tested on women it is not completely generalizable but for the athletic female population this is very applicable. And again other studies that had similar programs but were longer in duration produced benefits of similar magnitudes which suggests that these results are reasonable. The fact that this duration is effective also falls inline with accepted contemporary theories on strength training in that the early gains (under 6-8weeks) in strength and function are more based on neuromuscular adaptations rather than muscle hypertrophy. One must also consider again that since this study was done in a much shorter amount of time future programs like this should have less of a problem with patient compliance. 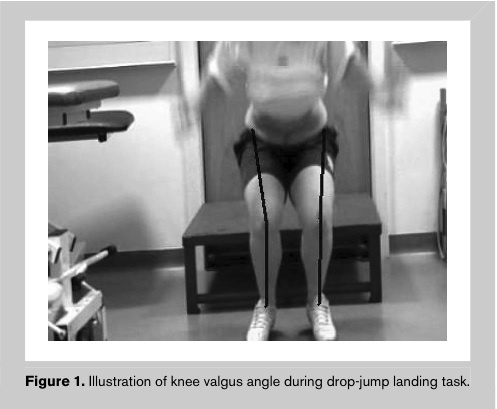 In the future I would like to see a study that evaluates the results of a jump training program conducted in 4 weeks and evaluate the valgus angle 4 weeks after completion of the program to asses the retention of these skills and compare those to a training program under a longer treatment duration. A study analyzing the trend in valgus angle decreases after a 4 week program that continues to 8 weeks would be useful as well to see if the benefits constantly improve with training or if they plateau and to see if the problem lies within motor control vs muscle girth/weakness. From a clinical aspect these results have huge ramifications for our profession. Injury prevention and performance are two avenues where therapists have the best skill set to make the highest impact. These results can be used as a selling point to coaches because not only do programs such as this prevent injury they have also demonstrated improved performance in relatively a short amount of time. Personally I would like more research to be conducted to further justify this compressed training schedule and programs for other joints such as the shoulder, back and hip. The more we can demonstrate the benefits of preventative interventions the more likely insurance will cover it especially if we can reduce risk with less cost per patient. This will not only provide more avenues for business but it will help our patients in the long run. Research drives reimbursement from insurance and reimbursement drives practice. I have always stood by the belief that its cheaper and more efficient to prevent a problem than to fix it. Think about it, if you maintain your car and check the oil regularly and brake fluid it will cost you substantially less than paying for it when one of those components fails or in the worst case you have an accident. The same can be said about the human body, if you maintain the body and keep it healthy you can prevent tissue failure and prevent serious injury. Included are some images of the results on pre and post test. More images to follow. On May 30th 2012 the New York times published an article (http://well.blogs.nytimes.com/2012/05/30/can-exercise-be-bad-for-you/) on a study by Bouchard et al (http://www.plosone.org/article/info%3Adoi%2F10.1371%2Fjournal.pone.0037887) which had discovered significant cardiometabolic adverse reactions in patients following exercise interventions. This report combined the findings of 6 studies and had a total of 1,687 subjects of various levels of health, risk factors, gender and age. These findings were quite profound in that currently exercise particularly aerobic exercise is recommended for patients to prevent or reduce the risk of cardiovascular pathologies. There have been numerous studies that support these claims; all one would have to do is search “exercise and cardiac benefits” to PubMed or even google and a plethora of articles in respectable journals would appear. It must be noted that the overwhelming majority of the interventions evaluated were endurance exercise, only two of the studies evaluated had subjects perform resistance exercise and of those two only one of the studies’ data was used in this report. The authors of this study are all well known and reputable and after reading the article myself I feel that their findings are solid. They effectively controlled for error in measurement by only classifying AR to be greater than 2 standard deviations from the average to even be considered ‘significant”. Their statistical analyses also controlled for bias due to duration, gender and other variables. Their population pool was enormous and quite variable and the dosage of exercise was considerably mixed which made these findings very generalizable. With all this being said I would agree with the authors in that stating though these findings do suggest that their may be a “statistically significant” percentage of people who experienced a deleterious effect from exercise, about 10% on average, one must must also realize that close to 90% of people did have positive benefit. When you take a step back and re-review these findings you realize that these findings are not that surprising. Any intervention there is always a chance for negative effects. Look at all of the drug therapies that are currently implemented, almost all could cause an adverse effect in a given patient. We are all very similar but we are all different at the cellular level and molecular level. If we were to abandon every intervention because 10% of the population have a negative side-effect we wouldn’t have that many left. The beauty of the healthcare system is that we have such variability in the way we can intervene with patients and treat pathologies. When the standard doesn’t work you try something else. The same should be said for exercise as well. As a future physical therapist I feel that this issue is something that we can get involved in. By that I mean what the authors suggested in their discussion which is that there is a 20-30% genetic link for some of these ARs. This finding suggests the need for blood work and pre-screening of patient before and exercise plan is ever administered especially to “at risk” patients. The most effective and efficient way to pre-screen someone for exercise is to administer a stress test which physical therapists are now doing more often with the progression of cardiac rehab. We have a chance to really get involve in this and I hope more research is done in the future in evaluating the ability of a stress test’s and concurrent blood work data at predicting ARs for patients. Too often exercise is prescribed capriciously with out considering that you may hurt your patient if you aren’t careful and treat the intervention as a medicine. I would also like future research to look at the combination of resistance exercise and aerobic on metabolic risk factors. This study only had one group that did both and they had ARs but less in total, they also had one of the smaller sample sizes and were not American. That’s enough from me take a look at the article and leave your comments below. Time to play cricket followed by watching the UFC fights. Good evening all! This is my first official blog post ever. I was always skeptical of creating a blog because I thought that they create a mentality of isolationism and narcissism. However, today I had rather illuminating lecture from a therapist who clearly demonstrated the benefits of having a blog and proved my presumptions to be false. Those who know me well realize that I can talk ad nauseam on things that I find interesting. What better way to express my opinions on subjects I am passionate about than a blog. So in short greetings blogsphere I am happy to join you. The main premise for my blog will be to review articles and topics I have found in the most recent scientific journals and provide you with my opinion. That being said I also will cover topical issues such as injuries and policy affecting healthcare specifically focused around the physical therapy profession.